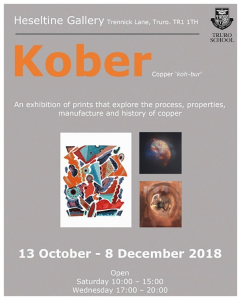 Kober is the Cornish word for copper and this exhibition promises to explore aspects of the metal including print and sculpture. The suite of ten copper plate etchings commissioned from myself and Jesse Leroy Smith by the Cornish and West Devon Mining Heritage Sites get another outing here. We're particularly pleased that a young audience will get the opportunity explore the prints as the Heseltine Gallery is located at Truro School and benefits their art education. This is an opportunity to visit me in my studio, see finished pieces as well as work in the making. Many pieces will be available to purchase and I will be on hand to talk about ideas and process. I also have a number of ceramic pieces available to purchase from my studio collection. The studio will be open to visitors between 11am & 4pm on the 28th & 29th May & the 1st, 3rd & 4th June 2017. I'm very pleased to announce that Arts Council England and FEAST have awarded grants to myself and Jesse Leroy Smith to spend time in our own studios making paintings influenced by the things we saw and experienced during our year working in the mining landscapes on the Picturing the Mines commission. The paintings will be shown in July 2017 at venues across the region alongside the Picturing the Mines artworks and four huge hand printed books from our 2014 project 'Travelogue Kernow'. 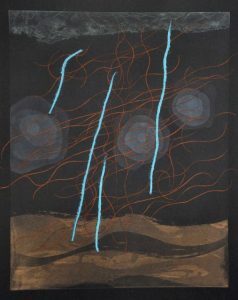 Falmouth Art Gallery has purchased the Picturing the Mines suite of ten etchings for their collection. They were made on copper plates in collaboration with Jesse Leroy Smith at John Howard's Penryn studio and first shown in 2016 at Falmouth Art Gallery as part of their printmaking exhibition 'Press Gang'. Commissioned by the Cornwall & West Devon Mining World Heritage Site they were the outcome of ten studio events led by myself & Jesse that took place across the region in 2016 and a year of research & journeying through the mining landscapes. Falmouth have a superb collection of historical and contemporary artists prints so we are extremely pleased that our suite has been added to the collection.